Back during my school days, I tasted this from our Christian neighbour during Christmas. She used to call all her neighbours to Christmas Sweets preparation at her home and my mom used to help her with this. They used to make sweet version of this with Maida and had a special wooden board with ridges specially made to prepare this snack. After years I tried my hands on this for Diwali. Got so busy with the festival mood that I forgot to share it here. So weeks later, posting it today. I didn't have that special wooden tool to make this, so decided to try on with a fork and it worked. My son too got excited hearing the name, so within minutes he was there with a chair and a fork dragging my hubby too in the kitchen to help me out. Wow! that was so sweet of my heroes. 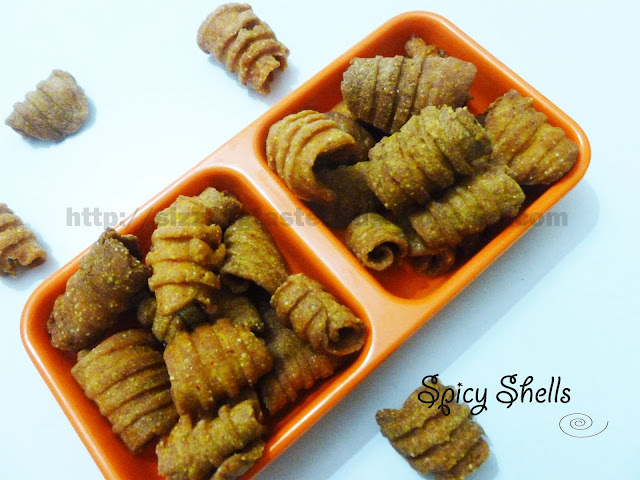 I have altered aunt's recipe by including spicy version and also substituting maida with Multi grained wheat flour. 1. 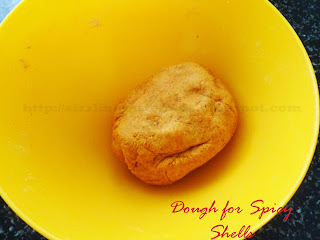 Take wheat flour, rice flour , red chilli powder, salt and Hing in a mixing bowl. Mix. 2. Heat a 1 tbsp oil or ghee and pour it in the mixing bowl. Mix well. 3. Now add sufficient water for kneading and knead well to make a soft dough. 4. Make small balls out of it. 5. Grease the fork or comb and take a ball and press it with thumb and roll it to get a shell shape. Continue this step with the remaining balls. 6. Deep fry the prepared shells and place it on an absorbent paper to remove excess oil. 7. When cooled, store it in an air- tight container.